Bicycles come in various different sizes, geometry and components. Bike manufacturers use adjustable components so that a rider can be properly accustomed to a bike. With the help of trained bike fitters who know the adjustments that are needed to be made to the components so that a rider is comfortable with the bike. People who can’t get comfortable with their present bike setup. Professional riders need a bike fit to maximise their efficiency. Experts are known to refine their riding positions. A professional bike fit should be considered as an investment that will be paid off as long as you ride your bike. As a recreational rider or beginner, you may have questions regarding what a professional bike fit can offer? Here are some of the benefits of professional bike fit. Your bike is set so that you get maximum performance. When your body is set in a position that you get proper muscle engagement and proper muscle recruitment. It will allow the rider to use multiple muscle groups in most effective and efficient manner, produce better power that enhances your endurance capabilities and perform to your optimum level. A professional bike fit makes sure that your legs are in the proper position while you are riding and get maximum comfort. Your leg is set in a bio-mechanically neutral position which minimizes the load on your muscles and joints. Many people buy bicycles based on brand names. But there are chances that top brands produce products that doesn’t fit you well. This is the case of most beginner riders. This can result in the purchase of an expensive and very compromised bike which you will not like to ride on. Proper bike fitting can find you good components that suit your riding. This can save you a lot of money. Depending on the rides you do and the physical problems you have whilst riding, the saddle level is adjusted accordingly. 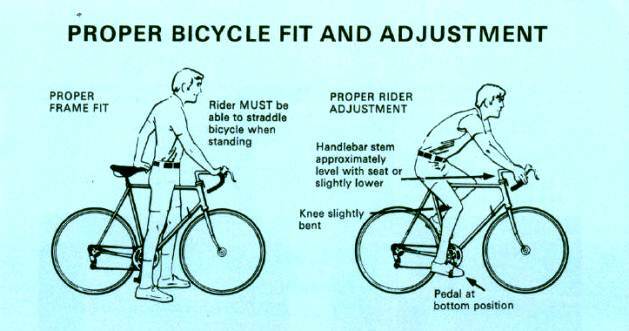 Improper saddle height can cause pain all over your body. It is really important that you have a proper saddle height whilst riding for efficient transfer of power to the pedals. The length of the stem that comes custom on your bike may not suit everyone, improper stem length can cause severe back pain. So the stem length is determined that suits your body posture. Given above are some of the adjustments done while doing a bike fit. Every one needs a proper bike fit. Today, there are a lot of professional bike fitters. Fitting can be great and give a jumping off point to your riding. But make sure that you go to the right person to do the fit so that your money is well spent for the long run.